PDF Cracker does not rely on any other third-party software, of course Adobe Acrobat and Reader are NOT required. Windows 10/8/7/Vista/XP. (support 32bit & 64bit). Support PDF1.8 (Acrobat 9.x) files, including 40-bit RC4 decryption, 128-bit RC4 decryption, AES decryption, compressed files and unencrypted metadata. 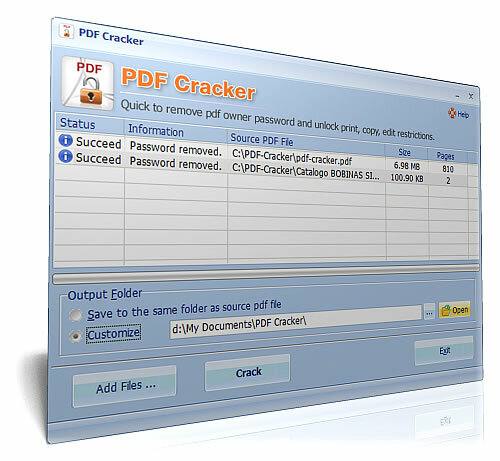 PDF Cracker can quick to decrypt protected Adobe Acrobat PDF file and removing restrictions on printing, editing, copying.